Book 3 in the Brides with Grit series is now available! She bought his homestead out from under him with her horse race winnings…and now he wants it back! 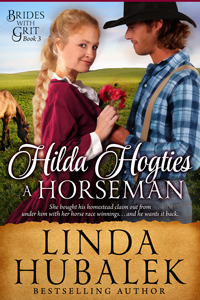 Hilda Hogties a Horseman the third book in my new historical western romance series, Brides with Grit, is now available on Amazon in both ebook and paperback. This clean, sweet historical romance set in 1873, continues the story of the Wilerson and Hamner families as the meet and marry on the Kansas prairie. Ranch woman Hilda Hamner spent her youth traveling with her Swedish immigrant family as they drove cattle from Texas up to Kansas cow towns in the 1870s. Hilda decided to get off the cattle trail and bought an abandoned homestead in Kansas with her horse race winnings. She plans on raising horses—and finding a husband that doesn’t mind her tall, lanky body that’s usually dressed in men’s clothing. Noah Wilerson planned to bring his intended bride from Illinois back to the Kansas homestead he started for them, but found out his fiancée had already married someone else when arriving at her father’s doorstep. After traveling back home, Noah finds a woman has taken over his claim, leaving him homeless and jobless. 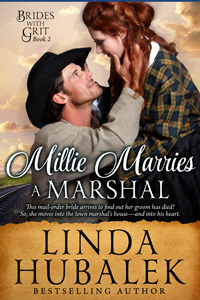 Hilda realizes she needs help to make her horse ranch successful, and decides that Noah is the right man—to promote from horseman to husband on her ranch—if he’ll treat her as a special woman, and not just a ranching partner. Noah wants his homestead back, and the woman who has transformed the simple soddie into a family home. Between family dramas, outlaw danger, and butting heads, which one will hogtie the other to get to the church altar first? Enjoy my latest story about women living and loving on the Kansas prairie! Next in line will be Cora Captures a Cowboy. Look for it later this spring.